The Aylmer, Ontario Amish settlement is a really, really neat one. There’s not much “touristy” to do there, so I’m not sure I’d plan a special trip just to go to Aylmer. But if you were passing through the area anyway or wanted to sort of throw it in as a larger visit to surrounding area of Ontario then by all means go. I made the mistake of visiting Aylmer during the belly of one of their worst winter’s in a decade. It’s a charming community, but I’d love a chance to return in the spring or summer sometime. 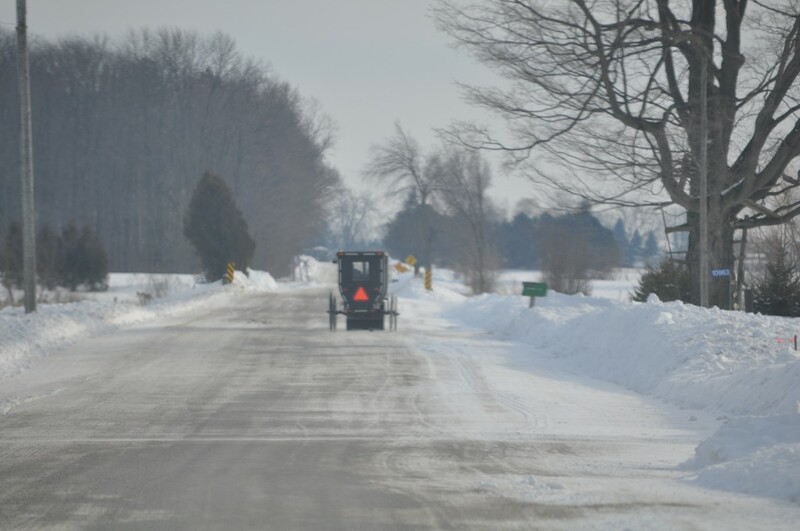 Aylmer is often viewed one of the most “intellectual” Amish communities since it is home to Pathway Publishing, which churns out all sorts of Amish-related texts and periodicals. The office is located on a quiet country road east of town. The Aylmer settlement is a “Plain melting pot” with there also being a lot of Mexican Mennonites who have returned to settle in Canada and a sizable population of Russian Mennonites who have retained a lot of their motherland customs. Each group can be spotted around town.